The Atlanta Braves need to win one game to continue their quest through the 2012 Postseason. That game comes on Friday against the St. Louis Cardinals at Turner Field and determines the National League’s true “Wild Card” under Major League Baseball’s new expanded playoffs. On the surface, the decision to start backup catcher David Ross over All-Star stalwart Brian McCann seems unorthodox to say the least. It was certainly not a question of loyalty for manager Fredi Gonzalez, but with the Braves’ postseason aspirations tied to a single game, one cannot afford to simply play favorites. Initially it was not a popular decision with McCann. How could it be? What player would not want to be in the lineup at a time like this? This has been the worst of McCann’s seven full seasons in the majors. An ailing right shoulder has plagued him throughout a campaign in which he set career lows with a .230 AVG, .300 OBP, and .399 SLG. Based on McCann’s downward trend over the final two months of the season, Ross represents the best option for Gonzalez and the Braves in the one-game “win or go home” scenario. Ross has spent four seasons with the Braves and has established himself as the best backup catcher in baseball. His powerful bat and veteran presence have been the perfect compliment for McCann when it was time for a day off. In his 577 at-bats with Atlanta – about a season’s worth of work for an everyday player – Ross has batted .269 with 24 homers and 94 RBI’s. Despite McCann’s down year, it remains common practice for most managers to load their lineup with left-handed bats against a right-hander like St Louis starter Kyle Lohse. In that regard, this is a case of going against the book. It is also a move that Gonzalez believes will give Atlanta the best chance to win this game. This season’s numbers support the decision there as well, with McCann batting .230 with 15 homers and 51 RBI’s in 84 games started by righties. Ross hit .260 with 4 home runs and 13 RBI’s in his 28 games against right-handed starters. Another – and perhaps more glaring – split statistic for each was performance at home this season. McCann connected for 11 of his 20 homers at Turner Field, but batted just .198 in 56 games there. That low mark for McCann included a dreadful 2-for-49 skid to close out the home schedule. While his sample size may be much smaller, Ross batted a solid .260 with 4 HR’s and 13 RBI’s in 23 home contests. Offensive numbers are one thing, but there is more to consider when it comes to what Ross has to offer his club. Friday starter Kris Medlen will be pitching the biggest game of his young career. His season deserves a blog post of its own, but what is important to note here is that, while Medlen has shined with both men behind the plate, he has been at his best working with Ross. Over 13 total appearances, Medlen sported a 0.81 ERA in 44-1/3 innings this year with Ross calling the signs. Perhaps more to the point was the success that the two men enjoyed as a battery in a trio of September starts. Two of those games rank among the best performances of the young right-hander’s career. Medlen allowed one unearned run to Washington while setting a career-high with 12 strikeouts in a complete game effort on September 3. Two starts later, he eclipsed that mark by fanning 13 Miami hitters over seven innings of one-run ball. Medlen capped his season by winning his ninth consecutive decision, defeating New York on September 30. 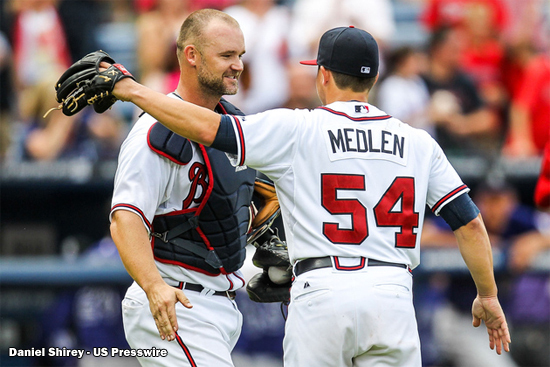 When Medlen worked with Ross in September, he allowed just 1 ER (3 total) in 22 innings for a 0.41 ERA. The 31 strikeouts came against just two walks and at the staggering rate of 12.7 K/9 IP. Opponents batted just .121 in those three starts. Any way you slice Medlen’s season, the numbers border on the absurd. McCann should be credited for his excellent handling of the staff, which included a 1.75 ERA in 92-2/3 innings pitched by Medlen during the regular season. The postseason, however, has proven itself to be a different monster entirely. Looking solely at what has been working lately with the pairing of Medlen and Ross, there is simply too much chemistry to ignore. That is not a swipe at McCann. It is simply the circumstances that the Braves find themselves in. All of those spits and statistics tell the story of why Fredi Gonzalez arrived at his decision to go with Ross over McCann. Plugging in a reserve catcher as skilled as Ross is a luxury that most if not every other team in baseball do not have. Make no mistake about it, Atlanta will need McCann to regain some of his All-Star form in order to make a successful run toward a World Series championship. One can only imagine that McCann would be more than happy to oblige. After all, the games only get bigger from here. We can throw a few more statistics and facts at the wall prior to the game.